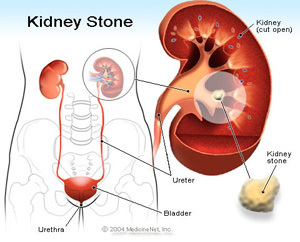 Stone in kidney , also known as a renal calculus ,is a solid concretion or crystal aggregation formed in the kidneys from dietary minerals in the urine. Urinary stones are typically classified by their location in the kidney (nephrolithiasis), ureter (ureterolithiasis), or bladder (cystolithiasis), or by their chemical composition (calcium-containing, struvite, uric acid, or other compounds). Kidney stones are a significant source of morbidity. 80% of those with kidney stones are men. Men most commonly experience their first episode between age 30–40 years, while for women the age at first presentation is somewhat later. In some people, chemicals crystallize in the urine and form the beginning, of a kidney stone. These stones are very tiny when they form, smaller than a grain of sand, but gradually can grow over time to 3 to 15 mm. . The size of the stone doesn't matter as much as where it is located and whether it obstructs or prevents urine from draining. Drink more water. Try to drink 12 full glasses of water a day. Drinking lots of water helps to flush away the substances that form stones in the kidneys. You can also drink ginger ale, lemon-lime sodas, and fruit juices. But water is best. Limit your coffee, tea, and cola to 1 or 2 cups a day because the caffeine may cause you to lose fluid too quickly. Woman drinking glass of water. Try to drink 12 full glasses of water every day. Your doctor may ask you to eat more of some foods and to cut back on other foods. For example, if you have a uric acid stone, your doctor may ask you to eat less meat, because meat breaks down to make uric acid. If you are prone to forming calcium oxalate stones, you may need to limit foods that are high in oxalate. These foods include rhubarb, beets, spinach, and chocolate. The doctor may give you medicines to prevent calcium and uric acid stones. Symptoms:The symptoms of kidney stones are pain while urinating, constant need to go to the bathroom, bad smells of urine, vomiting, nausea, chills and sweating. Also in some cases the patients also gets blood while urinating. Fact! About 90% of kidney stones are made of calcium oxalate. This is by far the simplest type of kidney stones to pass naturally. Fact! Over 90% of kidney stones are 5 mm or less. If your kidney stone is 7mm or less, a natural remedy is the perfect treatment. * max 6_7mm stones can be removes by passing uriene. Fact! If your remedy is larger than 7 mm, you will need to try the kidney stones removal remedy two to three times over the next three days. The bigger the stone, the more treatments needed. Fact! Some people have more than one kidney stone! Though more difficult to treat, many people have still found success with a natural treatment. * See your doctor if you have severe pain in your back or side that will not go away. * See your doctor if you have blood in your urine-urine will appear pink. * When you pass a stone, try to catch it in a strainer to show your doctor. drink plenty of water, fruit juice is also good for those having stones. avoind excess of milk and products bcoz it full of protein. intake of coconut water helps in passing off small stones through uriene.it also helps in removing toxic substance from the body. avoid veg like peas carrot cauliflower and fruits like parsley strawberries. You should also eliminate high sugar foods from your diet. High sugar intake is associated with an increased risk of kidney stones. Eating sugar free foods is a great way to help your body pass kidney stones naturally and also prevent them. Finally, we also recommend a diet using phosphoric acid. Many nurses and some doctors are now recommending a diet involving phosphoric acid because it can actually work be dissolving calcium based kidney stones. And because kidney stones are almost 90% calcium, this remedy has been extremely successful. avoid spicy food , that may cause acidity. Kidney Beans: Soak some kidney beans in water and keep it overnight. Next day cut these kidney beans and add them into about four liter of water and keep them for boiling. Boil them for about six to eight hours. Then strain this liquid and allow it to cool down. Once again strain it with the help of muslin cloth and drink one glass of this solution. After every two hours drink one glass of this liquid. Remember, as much you will drink this solution that much easily your kidney stones will get destroyed. Celery: Regular intake of celery will prevent kidney stones from occurring. If you have got kidney stones, then increase your intake of celery, as it is very effective in removing the kidney stones. Holy Basil: Prepare juice form fresh holy basil leaves and take about one teaspoon of this juice by mixing one teaspoon of honey into it. You will need to follow this remedy without fail for about six months to see the desirable results. Many patients of kidney stones have got relief from kidney stones using this remedy. Pomegranate: Eating pomegranate is also very effective in the treatment of kidney stones. Add paste of one teaspoon of pomegranate seeds into gram soup and drink it. This is one of the very effective home remedies for kidney stones. To prepare the gram soup first roast the gram flour and then use it to make soup. Grapes: Eating grapes and drinking grape juice both are equally effective in the treatment of kidney stones. Watermelon: Watermelon has rich water content and hence is very effective in diluting the kidney stones, so that they can pass through the urine without causing any pain. Diet: Say no to smoking and drinking alcohol, as this will add to the trouble of kidney stones. Drink plenty of water to maintain the water contents of the body. For the same purpose include fruits and vegetables that are rich in water content. Avoid oily and spicy food. Make your calcium and phosphates intake less by avoiding eating spinach, cauliflower, carrots, almonds, peas and soyabean.